Leslie Feist, bedre kendt som Feist (født 13. februar 1976 i Amherst, Nova Scotia, Canada), er en canadisk sanger og sangskriver, hvis debutalbum Monarch (Lay Your Jewelled Head Down) udkom i 1999. ^ Maddy Costa (26. marts 2012). 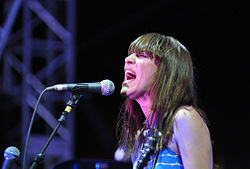 "Feist: Review – Royal Albert Hall, London". The Guardian. Hentet 17. oktober 2012. "...They are a band in their own right, Mountain Man: Feist leaves them alone to sing one of their own songs and she is almost upstaged,...."